Charity comes from the word charity meaning "generous love" from the Late Latin caritas, or "dear, beloved" from the Latin carus. It's known as a virtue name and was used by the Puritans. Surprisingly, Charity has been consistently -- albeit uncommonly -- used since records began in the US in 1880. It peaked from 1974-1980 or so, ranking as high as #183 in 1975. It left the Top 1000 in 2013. In 2017, there were 192 girls named Charity. Andrea is the Italian form of Andreas, which comes from the Greek name Ανδρεας (Andreas), meaning "manly", and related to Andrew. Andrea can be both masculine and feminine. As a female name, it gained usage in the 17th century before becoming common more recently. It started climbing the charts in the 1940s for girls and continued to steadily climb, peaking in 1981 at #24 and over 11,600 births. Today it ranks at #128. Rose may seem like a filler name now but it is truly an underrated classic with many longer variations and related names from Rosalie and Róisín to Rosabella and Rosette. It comes from Germanic elements referring to a kind of fame. Of course it is also derived from the Latin rosa in association with the flower. Always popular, Rose peaked in 1917 with 9,783 births. It declined after the 1950s, but is currently upticking again, ranking at #141 with 2,059 births in 2017. Bridget is the Anglicized form of the Irish name Brighid meaning "exalted one". It has usage in Irish mythology as the goddess of fire, poetry and wisdom. It has also been used by several saints. Bridget has been used in the US since the 1880s on record, and has always ranked within the Top 1000. It wasn't until the 1960s that it began rising in popularity. It peaked in 1973 with 2,765 births for the year. It has slowly declined since then, receiving 432 births in 2017 for a rank of #674. Aberdeen is a Scottish Gaelic name meaning "mouth of the Don" which is a river. It's a nature name and also a city in Scotland. This could be both masculine and feminine, but it only has US usage for females. However, births are very rare. There were two listings way back in 1919 and 1923 for a handful of births, but it wasn't heard from again until 1997. It has had regular usage since 2010, even as many as 25 births in 2017! Aurora is a triple threat. She was the Roman goddess of the morning, meaning "dawn" in Latin; she is a Disney Princess; and is also relevant to the Northern Lights from the term "Aurora Borealis", which makes her a celestial phenomenon. This name gives you a lot of bang for your buck! No wonder it is skyrocketing in popularity! It has always managed to remain within the Top 1000 since the 1880s, but it has been climbing mostly since 2006, joining the Top 100 in 2015 and ranking at a high of #51 in 2017! Ellie dates back in standalone usage to the 1880s, but it wasn't until the 2000s rolled in that it really started to shine! It joined the Top 1000 in 1992, and made it into the Top 100 by 2011, which is a pretty fast pace. Now it ranks as the 44th most popular name in the country in 2017. This is quite impressive for a diminutive, nickname name whose modest beginnings come longer names such as Eleanor, Elizabeth and Ellen. Tracy comes from an English surname meaning "domain belonging to Thracius", originally from a Norman French place name. It is also sometimes used as a nickname for Theresa. It has always been unisex, starting near the same time in the US for both genders in the 1880s. However, this name skyrocketed for females in the 1960s, peaking in 1970 with 18,467 births and a high ranking of #10 in the country. At the same time there were 1,774 male births. Madeline is the English form of Magdalene, which comes from a title referring to someone from Magdala. Madeline had a nice popularity boost in the 1910s, then peaked at its highest in 1998 at #50. While Madeline with this spelling has always been around since the 1880s, Madelyn is currently more popular. Madelyn surpassed Madeline between 2008 and 2009. Both spellings remain popular in 2017 with Madeline at #100 and Madelyn at #63. Maria is related to Mary from the Greek Μαρια and the Hebrew מִרְיָם. Mary's meaning isn't certain, but it could be either "sea of bitterness", "rebelliousness", or "wished for child". While Mary has obviously been extremely popular, perhaps the most-used female name over time, Maria is slightly less popular. It still ranks well, peaking in 1964 with 10,140 births; and as of 2017, it still received 2,700 births for a rank of #111. Penelope may come from the Greek πηνελοψ (penelops) which is actually a kind of duck. Another possibility is that pene means "threads" and ops means "face, eye" which could refer to a weaver. Penelope was famously the name of the wife of Odysseus from Homer's epic The Odyssey. This name wasn't consistently used until the 1910s in the US, and it had a small peak in usage in the 1940s. By the new millennium, Penelope was on her way up. It entered the Top 1000 in 2001 and the Top 100 in 2013. It was #24 in 2017. Daisy is directly related to the flower. However, it also derives from the Old English word dægeseage meaning "day eye". Sometimes Daisy is used as a nickname for Margaret due to the French name Marguerite becoming associated with the daisy in French. Margaret means "pearl" in Greek, and daisies were considered "pearls of the field" or "marguerites". In the US, Daisy has been used as a given name since records began in the 1880s. It was well used around the 1920s before declining to its lowest point in the 1970s. It rose again after that, reaching a popularity peak in 1996 with 2,514 female births for the year and a rank of #124. It ranked at #170 in 2017. Vivienne is the French feminine form of the Latin Vivianus, which comes from the word vivus meaning "alive". The spelling "Vivian" has always been much more common. It peaked in 1920 with over 4,100 births for the year. It declined between the 1960s and the 1990s, but it is climbing again in recent years, ranking as high as #97 in 2017. Whereas, Vivienne didn't pop up until 1895 in the US. It remained rare and ranked outside the Top 1000 until it suddenly leapt on the scene in 2009 with a ranking of #531. In 2017, it climbed up to #252. Elodie is the French form of Alodia which may be derived from a Visigothic name with Germanic elements such as alja meaning "foreign" and aud meaning "wealth". Talk about a name plucked from obscurity! It only ever received handfuls of births over the years since the 1880s, (anywhere from 5 to a high of 19 births in 1917); it wasn't used at all from the 1960s up until 1987 when it regained usage. It hasn't cracked the Top 1000 yet, but it is certainly on its way up the charts! It scored 251 births in 2017 for a rank of #1,025. Juniper is derived from the Latin word iuniperus or juniperus which is a combination of the word junio which means "young" and parere which means "to produce". These put together equal "youth producing" or "evergreen". Of course, a Juniper is a type of evergreen tree. Beyond this, Juniper could also be a derivation of the Welsh name Guinevere. Juniper was unused in the US until 1969, and it wasn't until 2011 that it entered the Top 1000. By 2017, it reached new heights of #314 for the year. Veronica is taken from the name Berenice which comes from the Greek name Φερενικη (Pherenike) meaning "bringing victory". Veronica was also influenced by the Latin phrase vera icon which gives it the alternate meaning "true image". Even dating back to 1880, Veronica has always ranked within the Top 500. It was most popular between the 1960s and the 1990s. It's on the downslope now, but still ranked at #378 in 2017. Lillian is likely a diminutive of Elizabeth, which means "my God is an oath" in Hebrew. Lillian is also considered an elongation of Lily, which comes from the flower and the Latin lilium. Lillian has always been common but it was super popular 100 years ago. In 1920, it received a peak of 10,049 female births for the year. By the 1960s it declined again to receiving 1000 or less births a year. However, starting around the early 1990s, it regained popularity, hitting a modern high of 7,156 births in 2012 for a rank of #26. It now ranks at #27 in 2017. Meredith comes from the Welsh name Maredudd or Meredydd which may mean "great lord" or "sea lord". It was originally a masculine name, but sometime around the 1920s it gained more usage for females, however, it remains masculine in Wales. In the US, it continued to have male usage as recently as 2011. Overall, it is most common for girls, especially peaking between the 1970s and 1990s. In 2017, there were 626 girls named Meredith for a ranking of #496. Adelaide has been around since the SSA began recording names in 1880. It comes from the German Adalheidis which is composed of the elements adal meaning "noble" and heid meaning "kind, sort, type." Before the name's modern spike in popularity, the year with the most number of births was 1917 with 537. Adelaide has only had two popularity spikes, the first starting around 1912 and lasting until it declined in the mid 1920s. From the 1950's to the 1990's, Adelaide was rarely used. However, starting just before the year 2000, Adelaide gained more usage. In 2005, it landed in the top 1000 and has been climbing in popularity. It ranked at #276 in 2017. Which of these names do you like the most? Would you use any? Nora, Sophie and Tabitha: Middle Name Ideas for Baby Girls! Are you expecting a baby girl soon? Congratulations! Have you found a name yet? If not, here are three lovely choices that you could consider: Nora, Sophie and Tabitha. I have paired each of these names with several middle names for ideas, just in case you're stumped. 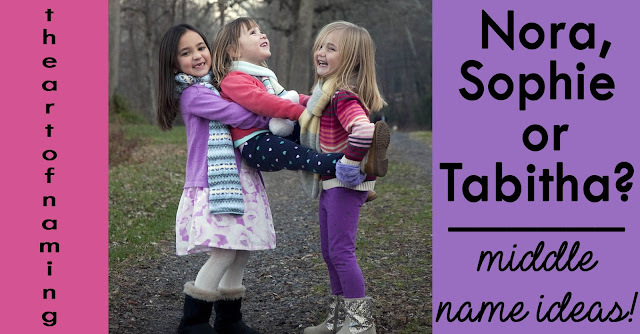 The middle names vary in popularity and style, but all flow nicely with the first names. Nora can be a short form of either Honora or Eleanor, and related names. Honora comes from the Latin Honorious meaning "honour". Eleanor comes from the Old French form of the Occitan name Aliénor, related to the name Aenor. Nora herself dates back to 1880 in the US on record, and has been used well. She had a boosted run from 1914 to 1930, and again from 1947 to 1964. Recently, Nora has increased in popularity in 2004, entering the Top 100 in 2013. Today, Nora ranks at #28. Sophie is the French form of Sophia, a Greek name meaning "wisdom". While it is no secret that Sophia has been very popular lately, even ranking at #1 in the country for 2011, 2012 and 2013, Sophie has been somewhat less popular. Both names date back in the US to 1880, and have enjoyed similar usage up until Sophie surged ahead from 1913 to 1925. After that, both remained common until Sophia began her popularity run starting in the 1980s. Sophie followed suit in the 2000s, but hasn't ranked nearly as high as Sophia. In 2017, Sophia was #5 and Sophie was #106. Tabitha is an Aramaic name meaning "gazelle". It is translated into Greek as the name Dorcas. As a name, Tabitha dates back in the US to 1880, but it was very rare until it suddenly went from 34 births in 1965 to 327 births in 1966. The boost can be explained by the television show "Bewitched" airing in 1966 with a character named Tabitha. It continued to have popularity through the 1970s, 1980s and 1990s before declining a bit starting in 2000. As of 2017, it left the Top 1000, but it is prime to be used as a familiar but uncommon choice today. Which of these combinations do you like? Can you list some more? 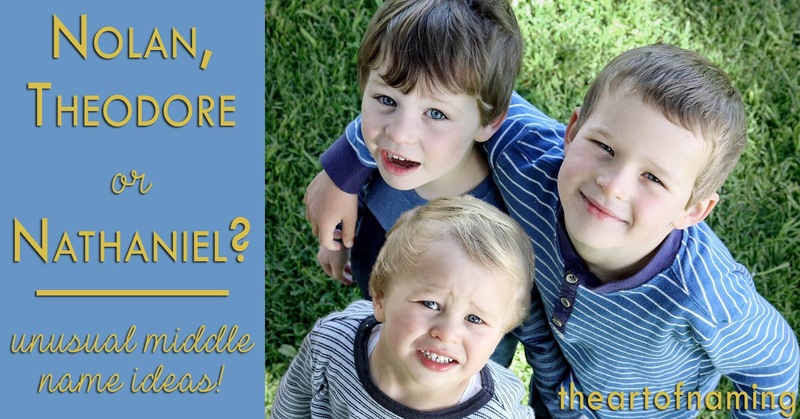 Name Search Report: Wilder, Gael, Milo and More Boy Names You Seek! Behind the scenes, I am able to view the search terms, or keywords, that are entered into search engines that lead viewers here to my site. Often, people are searching for specific names. Some of these names I have already covered previously on other articles, but some of them are new. I thought it was about time that I addressed the names that people are actually looking for. This series will pull names directly from that Name Search Report and investigate closer. The current data that I am using to evaluate a name's popularity comes straight from the Social Security Administration's 2017 popular name database. And I will also include name meanings found via BehindtheName.com. Here's our first group of boy names that you wanted more information about. Asa - Short, Biblical, Interesting... Asa is both bold but familiar for a boy today. It has always been in use, dating back on record to 1880, but it didn't truly catch on until a hundred years later. Since 1980, Asa has been trending upward, and it currently ranks at its highest modern peak of #490 in the US in 2017! This name possibly means "healer" in Hebrew. Jarvis - This name is somewhat old-fashioned and proper sounding, but it has potential to be a modern, trendy choice similar to Jasper. Jarvis has been regularly used since the 1910s and entered the Top 1000 in 1950, but it has never been popular. Its highest peak was in 1988 at #347. Today, it ranks below the Top 1000 at #1438. It comes from a surname which was derived from the given name Gervais meaning "spear". Wilder - Part surname, part word name, Wilder is very trendy right now. While it has made a handful of appearances dating back to 1914, Wilder was rare up until recently. It has skyrocketed, joining the Top 1000 for the first time in 2015, it ranked at #573 in 2017. It should continue to rise over the next few years. Herbert comes from Germanic elements meaning "army" and "bright". Of course, Herbert isn't the first name you'd list as a modern choice for a boy, but it has an old-fashioned charm about it. So old-fashioned, in fact, that it had its most usage in 1928 before nearly flat-lining today. As of 2017, there were only 77 boys named Herbert for a rank of #1880. Carlile - Carlile, along with the original spelling Carlisle, come from the name of a city in England, originally called Lugavalium by the Romans. It means "stronghold of Lugus". It was only later that "ker" was added to the name meaning "fort." Interestingly, Carlile has a total of 15 total births ever on record from 1880 to now. Carlisle has more usage over the years but remains rare. Its highest peak occurred in 2012 with a high of 47 births. In 2017, there were 40 boys and 12 girls named Carlisle. Milo is an Old Germanic form of the name Miles. It is also the Latinized form. It could come from the Slavic element milu meaning "gracious", or perhaps it is associated with the Latin miles meaning "soldier." Either way, Milo has always been in use, but it has really skyrocketed into popularity since the year 2001 when it first entered the Top 1000. It currently ranks at #224 for boys and probably continue to climb. Everett is a surname that comes from the given name Everard meaning "brave boar" in German. Its Old English equivalent was Eoforheard. Everett dates back to 1880 on record and enjoyed a popularity peak from 1914 to 1935. It maintained a similar number of births for decades after that until it began climbing in the mid-2000s. As of 2017, it ranked #104 and could burst into the Top 100 soon! Fisher comes from a German occupational surname literally referring to "fishermen", and often used by English and Jewish people. As a boys name in history, it hasn't been consistently used. It had a stretch from 1914 to 1933 and then disappeared until 1992. It entered the Top 1000 in 2004 and has slowly inched its way up to #765 in 2017. It could definitely have appeal as a rugged, outdoorsy surname name possibility. Oswin comes from Old English elements meaning "god" and "friend". It was also the name of a 7th-century king of Northumbria before ultimately losing usage after the 14th century. It was somewhat revived in the 19th century, but has laid dormant until it regained usage in 2000. While still extremely rare, there were 25 boys named Oswin in 2017, (and 6 girls). Daniel comes from the Hebrew name דָּנִיֵּאל (Daniyyel) meaning "God is my judge", and was the name of a biblical character. This name has been very popular throughout history, including England in the Middle Ages, but became rare in the 15th century. Today, of course, it is a classic. It peaked the highest in 1985 with 38,541 male births in the US, which ranked it at #5 for that year. In 2017, it ranks at #15 with 11,650 births. Finn could come from the Irish Fionn, meaning "fair" or "white"; or from the Old Norse name Finnr which refers to a "person from Finland". Either way, Finn was relatively unused as a boy's name until 1953. It entered the Top 1000 in the year 2000, and has been climbing fast ever since! As of 2017, it ranks #167. Along with longer forms of the name like Finley, Finnegan or Finnian, Finn is definitely a rising nickname too. Elijah is from the Hebrew name אֱלִיָּהוּ ('Eliyyahu) meaning "my God is YAHWEH". While Elijah has always been used in the US, it really started gaining popularity in the 1990s before skyrocketing recently. It entered the Top 100 in 1995 and now ranks at #8 in 2017. It's poised to be a classic. Vince, as you may know, comes from Vincent, which comes from the Roman name Vincentius, which was from Latin vincere meaning "to conquer". Along with being the name of many saints, it has been in use since the Middle Ages. It has also been consistently well-used over the years, hovering around the Top 100 rank. In 2017, it ranked at #108 for boys. Markus is the German and Scandinavian form of Mark, a form of Marcus. Marcus is probably derived from the Roman god Mars, the god of war. Marcus dates back to the 1880s in the US, growing most popular during the 1980s. Markus has been in the Top 1000 since the 1960s, ranking at #933 in 2017. Gael may refer to speakers of Gaelic languages. It could also be a variant of the French/Breton name Gwenaël meaning "blessed and generous". As a boy name, Gael has been rare, popping up occasionally between 1919 and 1952, but it wasn't in regular usage until 1992. It joined the Top 1000 in 2002 and is now up to #178 in 2017. Remy may be the French form of the Latin Remigius, which comes the remigis meaning "oarsman, rower". It could also be short for Remington, which is an Old English surname and place name meaning "boundary stream" and "settlement". Remy began as a boys name as far back as 1914, but it is rapidly raising for both genders. It entered the Top 1000 for boys in 2009, followed by 2014 for girls. It ranks #449 for boys and #605 for girls in 2017. Elias is a cognate of the name Elijah, which we already mentioned is very popular today. Elias has the same meaning and origin, and is similarly gaining popularity today in the US. It dates back to 1880 and maintained a steady amount of usage over the decades leading up to an increase beginning around the 1990s. Elias entered the Top 100 in 2015 and now ranks at #78 and climbing! Lennox comes from a Scottish surname which came from the name of a district in Scotland called Leamhnachd in Gaelic, possibly meaning "place of elms". As a boy name, it had a handful of sightings as far back as 1918, but it didn't gain speed until the 1990s. It has quickly escaped obscurity, joining the Top 1000 in 2010 and reaching as high as #408 for boys in 2017. It also gained usage for girls in 2005, skyrocketing from beyond the Top 1000 in 2014, to ranking at #665 in 2017. 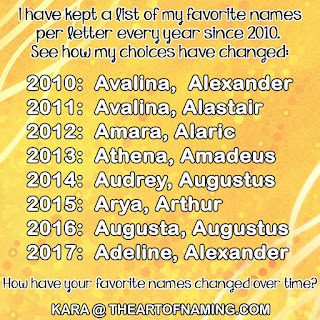 Which of these names do you like best? What middle names would you pair with them? Share your favorites in the comments below!